Craig Murray on the media response to Boshirov and Petrov’s story – whatever happened to presumption of innocence? Former ambassador and independent journalist Craig Murray is no friend of the Kremlin or Putin but has been outspoken in his doubts over UK government allegations relating to the poisoning of Sergei and Yulia Skripal. In previous articles he has cross-examined the government case point by point, and now he considers the latest evidence provided in the RT interview of suspects Ruslan Boshirov and Alexander Petrov. The presumption of innocence is the principle that one is considered innocent unless proven guilty. It was traditionally expressed by the Latin maxim ei incumbit probatio qui dicit, non qui negat (“the burden of proof is on the one who declares, not on one who denies”). The Universal Declaration of Human Rights, article 11, states: “Everyone charged with a penal offence has the right to be presumed innocent until proved guilty according to law in a public trial at which he has had all the guarantees necessary for his defence.”. I was caught in a twitterstorm of hatred yesterday, much of it led by mainstream media journalists like David Aaronovitch and Dan Hodges, for daring to suggest that the basic elements of Boshirov and Petrov’s story do in fact stack up. What became very plain quite quickly was that none of these people had any grasp of the detail of the suspects’ full twenty minute interview [also embedded below], but had just seen the short clips or quotes as presented by British corporate and state media. 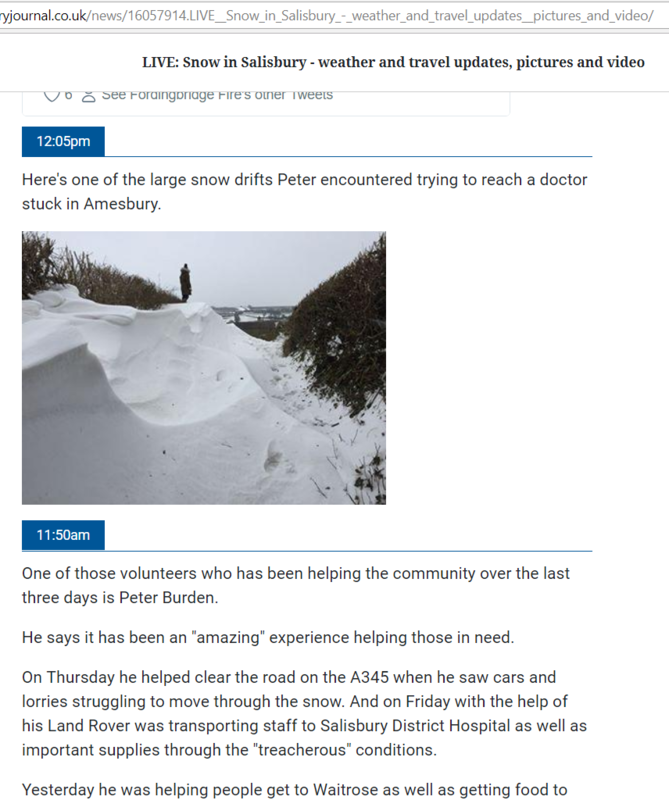 As I explained in my last post [see below], what first gave me some sympathy for the Russians’ story and drew me to look at it closer, was the raft of social media claims that there was no snow in Salisbury that weekend and Stonehenge had not been closed. 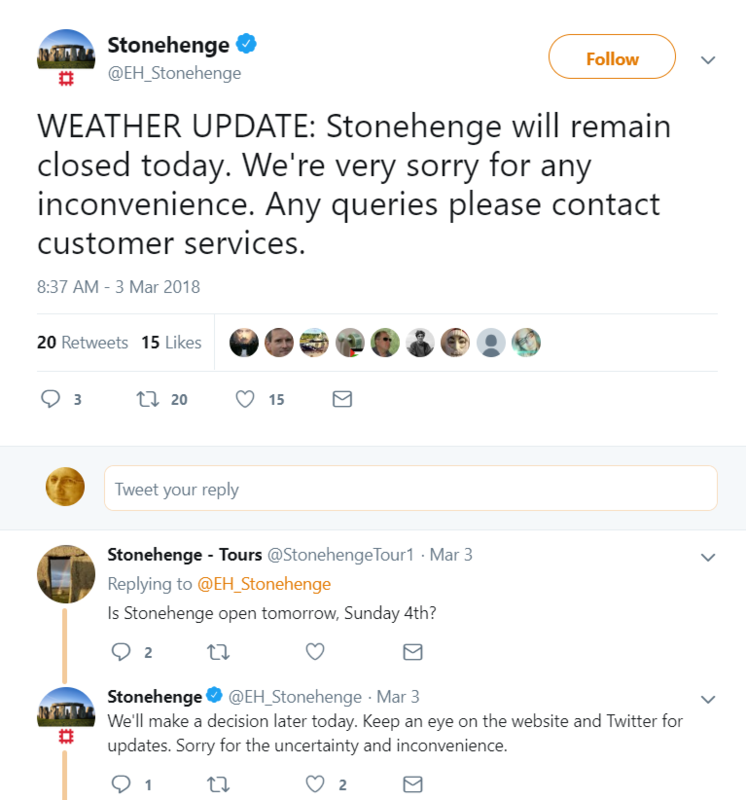 In fact, Stonehenge was indeed closed on 3 March by heavy snow, as confirmed by English Heritage. So the story that they came to Salisbury on 3 March but could not go to Stonehenge because of heavy snow did stand up, contrary to almost the entire twittersphere. Once there was some pushback of truth about this on social media, people started triumphantly posting the CCTV images from 4 March to prove that there was no snow lying in Central Salisbury on 4 March. But nobody ever said there was snow on 4 March – in fact Borisov and Petrov specifically stated that they learnt there was a thaw so they went back. However when they got there, they encountered heavy sleet and got drenched through. That accords precisely with the photographic evidence in which they are plainly drenched through. Another extraordinary meme that causes hilarity on twitter is that Russians might be deterred by snow or cold weather. Well, Russians are human beings just like us. They cope with cold weather at home because they have the right clothes. Boshirov and Petrov refer continually in the interview to cold, wet feet and again this is borne out by the photographic evidence – they were wearing sneakers unsuitable to the freak weather conditions that were prevalent in Salisbury on 3 and 4 March. They are indeed soaked through in the pictures, just as they said in the interview. Russians are no more immune to cold and wet than you are. Twitter is replete with claims that they were strange tourists, to be visiting a housing estate. No evidence has been produced anywhere that shows them on any housing estate. They were seen on CCTV camera walking up the A36 by the Shell station, some 400 yards from the Skripals’ house, which would require three turnings to get to that – turnings nobody saw them take (and they were on the wrong side of the road for the first turning, even though it would be very close). No evidence has been mentioned which puts them at the Skripals’ House. Finally, it is everywhere asserted that it is very strange that Russians would take a weekend break holiday, and that if they did they could not possibly be interested in architecture or history. This is a simple expression of anti-Russian racism. Plainly before their interview – about which they were understandably nervous – they prepared what they were going to say, including checking up on what it was they expected to see in Salisbury because they realised they would very obviously be asked why they went. Because their answer was prepared does not make it untrue. That literally people thousands of people have taken to twitter to mock that it is hilariously improbable that tourists might want to visit Salisbury Cathedral and Stonehenge, is a plain example of the irrationality that can overtake people when gripped by mob hatred. I am astonished by the hatred that has been unleashed. The story of Gerry Conlon might, you would hope, give us pause as to presuming the guilt of somebody who just happened to be of the “enemy” nationality, in the wrong place at the wrong time. Despite the mocking mob, there is nothing inherently improbable in the tale told by the two men. What matters is whether they can be connected to the novichok, and here the safety of the identification of the microscopic traces of novichok allegedly found in their hotel bedroom is key. I am no scientist, but I have been told by someone who is, that if the particle(s) were as the police state so small as to be harmless to humans, they would be too small for mass spectrometry analysis and almost certainly could not be firmly identified other than as an organophosphate. Perhaps someone qualified might care to comment. The hotel room novichok is the key question in this case. Were I Vladimir Putin, I would persuade Boshirov and Petrov voluntarily to come to the UK and stand trial, on condition that it was a genuinely fair trial before a jury in which the entire proceedings, and all of the evidence, was open and public, and the Skripals and Pablo Miller might be called as witnesses and cross-examined. I have no doubt that the British government’s desire for justice would suddenly move into rapid retreat if their bluff was called in this way. As for me, when I see a howling mob rushing to judgement and making at least some claims which are utterly unfounded, and when I see that mob fueled and egged on by information from the security services propagated by exactly the same mainstream media journalists who propagandised the lies about Iraqi WMD, I see it as my job to stand in the way of the mob and to ask cool questions. If that makes them hate me, then I must be having some impact. So I ask this question again – and nobody so far has attempted to give me an answer. At what time did the Skripals touch their doorknob? Boshirov and Petrov arrived in Salisbury at 11.48 and could not have painted the doorknob before noon. The Skripals had left their house at 09.15, with their mobile phones switched off so they could not be geo-located. Their car was caught on CCTV on three cameras heading out of Salisbury to the North East. At 13.15 it was again caught on camera heading back in to the town centre from the North West. How had the Skripals managed to get back to their home, and touch the door handle, in the hour between noon and 1pm, without being caught on any of the CCTV cameras that caught them going out and caught the Russian visitors so extensively? After this remarkably invisible journey, what time did they touch the door handle? I am not going to begin to accept the guilt of Boshirov and Petrov until somebody answers that question. Dan Hodges? David Aaronovitch? Theresa May? Anybody? Reposted in full from an article entitled “Lynch Mob Mentality” published today by Craig Murray. Here is Craig Murray’s initial response in full (with images retained) published on his blog yesterday and entitled “The Strange Russian Alibi”. Like many, my first thought at the interview of Boshirov and Petrov – which apparently are indeed their names – is that they were very unconvincing. The interview itself seemed to be set up around a cramped table with a poor camera and lighting, and the interviewer seemed pretty hopeless at asking probing questions that would shed any real light. I had in fact decided that their story was highly improbable, until I started seeing the storm of twitter posting, much of it from mainstream media journalists, which stated that individual things were impossible which were, in fact, not impossible at all. The first and most obvious regards the weather on 3 and 4 March. It is in fact absolutely true that, if the two had gone down to Salisbury on 3 March with the intention of going to Stonehenge, they would have been unable to get there because of the snow. It is therefore perfectly possible that they went back the next day to try again; and public transport out of Salisbury was still severely disrupted, and many roads closed, on 4 March. Proof of this is not at all difficult to find. Those mocking the idea that the pair were blocked by snow from visiting Stonehenge have pointed to the CCTV footage of central Salisbury not showing snow on the afternoon of 4 March. Well, that is central Salisbury, it had of course been salted and cleared. Outside there were drifts. So that part of their story in fact turns out not to be implausible as social media is making out; in fact it fits precisely with the actual facts. The second part of their story that has brought ridicule is the notion that two Russians would fly to the UK for the weekend and try to visit Salisbury. This ridicule has been very strange to me. Weekend breaks – arrive on Friday and return on Sunday – are a standard part of the holiday industry. Why is it apparently unthinkable that Russians fly on weekend breaks as well as British people? 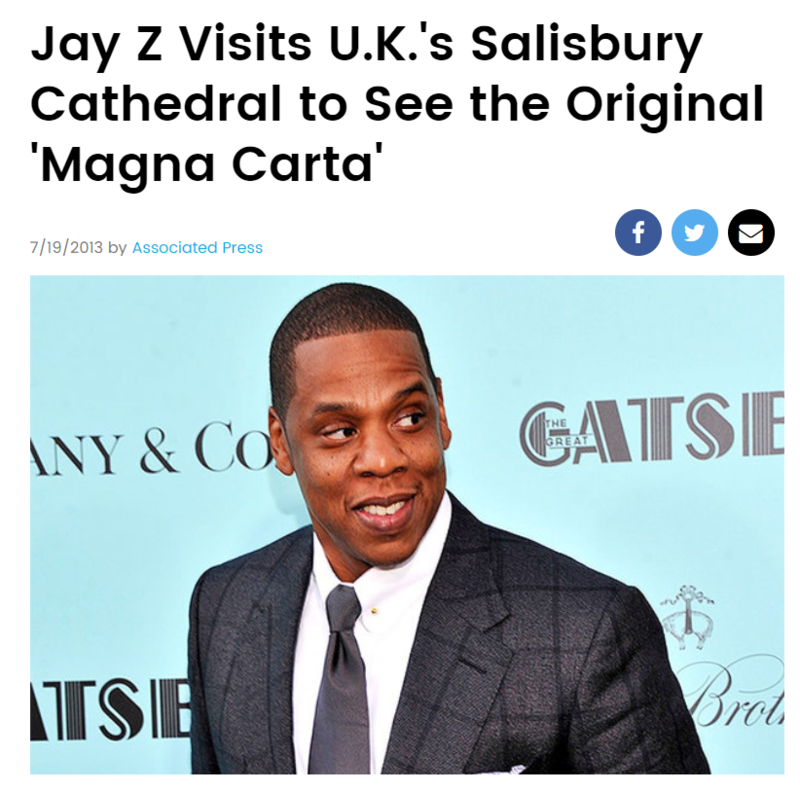 Even more strange is the idea that it is wildly improbable for Russian visitors to wish to visit Salisbury cathedral and Stonehenge. Salisbury Cathedral is one of the most breathtaking achievements of Norman architecture, one of the great cathedrals of Europe. It attracts a great many foreign visitors. Stonehenge is world famous and a world heritage site. I went on holiday this year and visited Wurzburg to see the Bishop’s Palace, and then the winery cooperative at Sommerach. Because somebody does not choose to spend their leisure time on a beach in Benidorm does not make them a killer. Lots of people go to Salisbury Cathedral. There seems to be a racist motif here – Russians cannot possibly have intellectual or historical interests, or afford weekend breaks. The final meme which has worried me is “if they went to see the cathedral, why did they visit the Skripal house?” Well, no evidence at all has been presented that they visited the Skripal house. They were captured on CCTV walking past a petrol station 500 yards away – that is the closest they have been placed to the Skripal house. The greater mystery about these two is, if they did visit the Skripal House and paint Novichok on the doorknob, why did they afterwards walk straight past the railway station again and head into Salisbury city centre, where they were caught window shopping in a coin and souvenir shop with apparently not a care in the world, before eventually returning to the train station? It seems a very strange attitude to a getaway after an attempted murder. In truth their demeanour throughout the photographs is consistent with their tourism story. The Russians have so far presented this pair in a very unconvincing light. But on investigation, the elements of their story which are claimed to be wildly improbable are not inconsistent with the facts. There remains the much larger question of the timing. The Metropolitan Police state that Boshirov and Petrov did not arrive in Salisbury until 11.48 on the day of the poisoning. That means that they could not have applied a nerve agent to the Skripals’ doorknob before noon at the earliest. But there has never been any indication that the Skripals returned to their home after noon on Sunday 4 March. If they did so, they and/or their car somehow avoided all CCTV cameras. Remember they were caught by three CCTV cameras on leaving, and Borishov and Petrov were caught frequently on CCTV on arriving. The Skripals were next seen on CCTV at 13.30, driving down Devizes road. After that their movements were clearly witnessed or recorded until their admission to hospital. So even if the Skripals made an “invisible” trip home before being seen on Devizes Road, that means the very latest they could have touched the doorknob is 13.15. The longest possible gap between the novichok being placed on the doorknob and the Skripals touching it would have been one hour and 15 minutes. Do you recall all those “experts” leaping in to tell us that the “ten times deadlier than VX” nerve agent was not fatal because it had degraded overnight on the doorknob? Well that cannot be true. The time between application and contact was between a minute and (at most) just over an hour on this new timeline. In general it is worth observing that the Skripals, and poor Dawn Sturgess and Charlie Rowley, all managed to achieve almost complete CCTV invisibility in their widespread movements around Salisbury at the key times, while in contrast “Petrov and Boshirov” managed to be frequently caught in high quality all the time during their brief visit. This is especially remarkable in the case of the Skripals’ location around noon on 4 March. The government can only maintain that they returned home at this time, as they insist they got the nerve agent from the doorknob. But why was their car so frequently caught on CCTV leaving, but not at all returning? It appears very much more probable that they came into contact with the nerve agent somewhere else, while they were out. I shall write a further post on these timing questions shortly. Detailed below are five outstanding questions. Questions one and two pertain directly to the incidents of the Salisbury and Amesbury poisonings; three and four look into the background to the case and find improbable links to the ongoing ‘Russiagate’ allegations; and the last question relates to the potentially buried testimony of Yulia Skripal. All sections are based on a quoted sequence of earlier posts written by Craig Murray, who has been foremost in cross-examining the government case (links to each post are provided as footnotes to be read in full). When did the Skripals touch the doorknob? At 09.15 on Sunday 4 March the Skripals’ car was seen on CCTV driving through three different locations in Salisbury. Both Skripals had switched off their mobile phones and they remained off for over four hours, which has baffled geo-location. There is no CCTV footage that indicates the Skripals returning to their home. It has therefore always been assumed that they last touched the door handle around 9am. But the Metropolitan Police state that Boshirov and Petrov did not arrive in Salisbury until 11.48 on the day of the poisoning. That means that they could not have applied a nerve agent to the Skripals’ doorknob before noon at the earliest. But there has never been any indication that the Skripals returned to their home after noon on Sunday 4 March. If they did so, they and/or their car somehow avoided all CCTV cameras. Remember they were caught by three CCTV cameras on leaving, and Borishov and Petrov were caught frequently on CCTV on arriving. Why was the perfume bottle found by Charlie Rowley still sealed? He said it was unopened, the box it was in was sealed, and that they had to use a knife in order to cut through it. “That raises the question: if it wasn’t used, is this the only Novichok that exists in this city? And was it the same Novichok used to attack Sergei and Yulia Skripal? But the information about opening the packet with a knife is not in the linked interview. What Rowley does say in the interview is that the box was still sealed in its cellophane. Presumably it was the cellophane he slit open with a knife. What is Sergei Skripal’s connection to Christopher Steele and ‘Russiagate’? Skripal had not retired but was active for MI6 on gigs briefing overseas intelligence agencies about Russia. This did not increase his threat to Russia, as he told everything he knows a decade ago. But it could provide an element of annoyance that would indeed increase Russian official desire to punish him further. But the fact he was still very much active has a far greater significance. The government slapped a D(SMA) notice on the identity of Pablo Miller, Skripal’s former MI6 handler who lives close by in Salisbury and who worked for Christopher Steele’s Orbis Intelligence at the time that Orbis produced the extremely unreliable dossier on Trump/Russia. The fact that Skripal had not retired but was still briefing on Russia, to me raises to a near certainty the likelihood that Skripal worked with Miller on the Trump dossier. I have to say that, as a former Ambassador in the former Soviet Union trained in intelligence analysis and familiar with MI6 intelligence out of Moscow, I agree with every word of this professional dissection of the Orbis Trump dossier by Paul Roderick Gregory, irrespective of Gregory’s politics. In particular this paragraph, which Gregory wrote more than a year before the Salisbury attack, certainly applies to much of the dossier. I have picked out just a few excerpts from the Orbis report. It was written, in my opinion, not by an ex British intelligence officer but by a Russian trained in the KGB tradition. It is full of names, dates, meetings, quarrels, and events that are hearsay (one an overheard conversation). It is a collection of “this important person” said this to “another important person.” There is no record; no informant is identified by name or by more than a generic title. The report appears to fail the veracity test in the one instance of a purported meeting in which names, dates, and location are provided. Some of the stories are so bizarre (the Rosneft bribe) that they fail the laugh test. Yet, there appears to be a desire on the part of some media and Trump opponents on both sides of the aisle to picture the Orbis report as genuine but unverifiable. The Russian ex-intelligence officer who we know was in extremely close contact with Orbis at the time the report was written, was Sergei Skripal. What does BBC’s Mark Urban know about the case? had been having meetings with Sergei Skripal only last summer. information that supports and is closely associated with these creative activities. Click here to read Craig Murray’s follow-up post regarding the BBC’s refusal to reply to him. Where are Sergei and Yulia Skripal today? Mark Urban’s piece for Newsnight tonight [July 5th] was simply disgusting; it did not even pretend to be more than a propaganda piece on behalf of the security services, who had told Urban (as he said) that Yulia Skripal’s phone “could have been” tapped by the Russians and they “might even” have listened to her conversations through the microphone in her telephone. That was the “new evidence” that the Russians were behind everything. I was happy to see Yulia alive and looking reasonably well yesterday, if understandably stressed. Notably, and in sharp contrast to Litvinenko, she leveled no accusations at Russia or anybody else for her poisoning. In Russian she spoke quite naturally. Of the Russian Embassy she said very simply “I am not ready, I do not want their help”. Strangely this is again translated in the Reuters subtitles by the strangulated officialese of “I do not wish to avail myself of their services”, as originally stated in the unnatural Metropolitan Police statement issued on her behalf weeks ago. “I do not wish to avail myself of their services” is simply not a translation of what she says in Russian and totally misses the “I am not ready” opening phrase of that sentence. My conclusion is that Yulia’s statement was written by a British official and then translated to Russian for her to speak, rather than the other way round. Also that rather than translate what she said in Russian themselves for the subtitles, Reuters have subtitled using a British government script they have been given. It would of course have been much more convincing had Sergei also been present. Duress cannot be ruled out when he is held by the British authorities. I remain extremely suspicious that, at the very first chance she got in hospital, Yulia managed to get hold of a telephone (we don’t know how, it was not her own and she has not had access to one since) and phone her cousin Viktoria, yet since then the Skripals have made no attempt to contact their family in Russia. That includes no contact to Sergei’s aged mum, Yulia’s grandmother, who Viktoria cares for. Sergei normally calls his mother – who is 89 – regularly. This lack of contact is a worrying sign that the Skripals may be prevented from free communication to the outside world. Yulia’s controlled and scripted performance makes that more rather than less likely. I would like to thank Craig Murray for allowing the reproduction of these articles. Not all of the views expressed are necessarily ones shared by ‘wall of controversy’. Dr Busby, who has previously advised the government on radiation risks, said neighbours had reported his 29-year-old housemate “acting strangely”. A cordon was set up around his home on Wednesday morning when the two officers complained of feeling unwell – which Dr Busby attributed to “psychological problems associated with their knowledge of the Skripal poisoning”. The scientist said he was handcuffed and interviewed all night by police who suspected he was making a bomb, but the only substances found at his home were “innocuous chemicals for research into radiation”. Click here to read the BBC news report from September 13th. 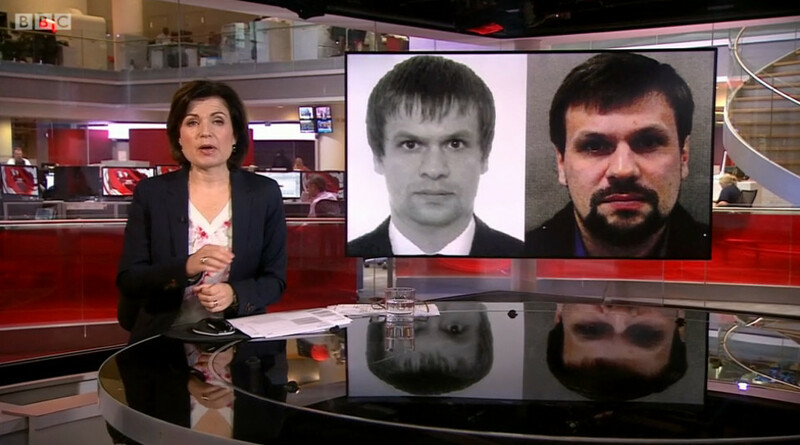 On Friday 14th BBC2’s Newsnight broadcast the recording of a phone interview between Kirsty Wark and editor-in-chief of RT, Margarita Simonyan, the interviewer of Boshirov and Petrov. If you watch the clip to the end you will see that Kirsty Wark brings the discussion around to accuse Simonyan of being a Russian state propagandist at which point Simonyan rather conveniently hangs up. She may well have done so and was within her rights, although refusal to answer questions will be seen by many as a tacit admission of guilt. Doubtless, this is how the BBC would have scripted it, so who knows, dare I suggest that the BBC may have hung up on her? The problem is with Bellingcat’s methodology. They did not start with any prior intelligence that “Chepiga” is “Boshirov”. They rather allegedly searched databases of GRU operatives of about the right age, then trawled photos in yearbooks of them until they found one that looked a bit like “Boshirov”. And guess what? It looks a bit like “Boshirov”. If you ignore the substantially different skull shape and nose. Only the picture on the left is Chepiga. The two on the right are from “Boshirov’s” Russian passport application file, and the photo of “Boshirov” issued by Scotland Yard. Like almost the entire internet, I assumed both black and white photos were from Chepiga’s files, and was willing to admit the identification of Chepiga with “Boshirov” as valid. But once you understand is that – as Bellingcat confirm if you read it closely – only the photo on the left is Chepiga, you start to ask questions. The two guys on the right and the centre are undoubtedly the same person. But is the guy on the left the same, but younger? Betaface.com, which runs industry standard software, gives the faces an 83% similarity, putting the probability of them being the same person at 2.8%. By comparison it gives me a 72% identity with Chepiga and a 2.1% chance of being him. There is a superficial resemblance. 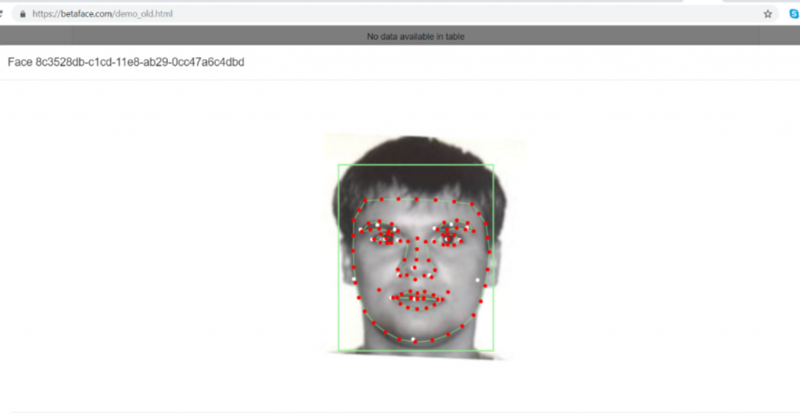 But if you take the standard ratios used for facial recognition, you get a very different story. If you draw a line between the centre of the pupils of the two guys centre and right, and then take a perpendicular from that line to the tip of the nose, you get a key ratio. The two on the right both have a ratio of 100:75, which is unsurprising since they are the same person. The one on the left has a ratio of 100:68, which is very different. I will continue to form my opinions as further evidence becomes available. UPDATE Incredibly, at 13.15 on 27 September the BBC TV News ran the story showing only the two photos of “Boshirov”, which of course are the same person, and not showing the photo of Chepiga at all! Click here to read Craig Murray’s full article entitled “’Boshirov’ is probably not ‘Chepiga’. But he is also not ‘Boshirov’”. Bellingcat’s attempts to gild the Chepiga lily are now becoming ludicrous. The photo they published today [October 3rd] is a very obvious fake. Many people have noticed that the photo of Chepiga on this wall appears to be hanging in completely different lighting conditions from the others. That is indeed a good point. But there is a more important point here, and that is to do with sequencing. 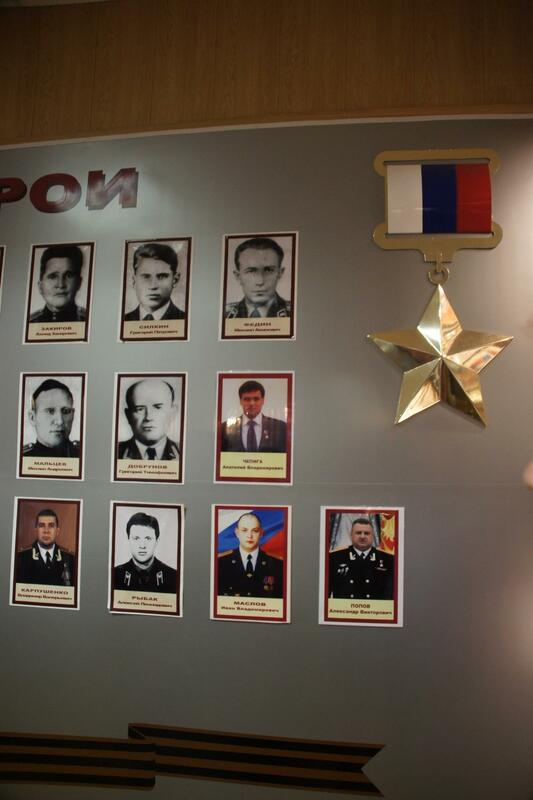 Except for Chepiga and Popov, who according to Belligncat also became a Hero of Russia in 2014, all of the people here are indeed openly and officially listed Heroes of Russia or, in the majority of cases, Heroes of the Soviet Union. Karpushenko (2000), Ribak (2005), Maclov (2012), Popov (2014). So why is Chepiga in a row of much earlier Heroes of the Soviet Union? Next in sequence in fact to Grigory Dobrunov who got his award in 1956!!!! The pictures are definitely otherwise all in date order. The glaringly obvious answer – in line with the reflections anomaly – is that Chepiga’s “picture” has been photoshopped onto this wall. The military do not suddenly insert photos out of order and at random on an honours board. Bellingcat, however, have a track record of image manipulation. None of which proves or disproves the Boshirov identification. It is however an important reminder to take Bellingcat as a source with a pinch of salt. Click here to read Craig Murray’s original post entitled “Bellingcat’s Very Obviously Fake Chepiga Photo”. I disagree with Murray’s point about the different lighting conditions, and a bit like the photos of the two walking through airport gates at the same time [from a previous post], he is too eager to jump to convenient conclusions. The key image is middle row, right hand side. Yes, it has a large veiling reflection on it that does not appear (so strongly) on other photos, but that is not unusual. It’s like when you could see a reflection of a window or the room light on your TV (when it was a CRT); it covered a part of the screen but not all of it. It could be fake, but the lighting argument doesn’t work. These measured words are taken from Nick Hornby’s book Fever Pitch. They form the opening to his chapter entitled simply “Hillsborough”, in which he describes the moments when he, along with hundreds of thousands of others at different football grounds across Britain, were first waking up to the dreadful news of what had happened earlier in Sheffield. At this same time, and like many millions of others, I’d been watching the tragedy unfold live on TV. Cameras were there because the game between Liverpool and Forest was meant to have featured later on Match of the Day, but the game itself had barely kicked off before it had been abandoned. Rather than the beautiful game, we had instead watched in sorrow and disbelief, finding it hard to comprehend the sheer scale of the disaster. 96 innocent people who had gone out to enjoy a football match had lost their lives instead, and every other football fan felt the same, had the same thought: that there but for the grace of god go I. 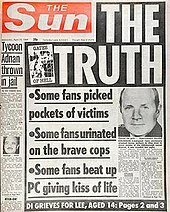 Now, 23 years later, we have access to a little more of the awful truth, and not only regarding the failures of the police and other emergency services that had both caused and exacerbated the catastrophic sequence of events at Hillsborough, but also to the cover up that immediately followed. A conspiracy of silence that has since been maintained by the police themselves, was assisted by the deliberately distorted coverage of the press, and that had also involved the complicity of politicians all the way up to members within the cabinet of the Thatcher government. “The Truth” as sensationally portrayed by Murdoch’s The Sun headlines is an obscene and defamatory fiction: part of a co-ordinated effort that helped to derail the investigation and thus to pervert the course of justice. Not everyone was deceived. The people of Liverpool understood immediately and banished the newspaper from their streets in collective outrage. Then, at the beginning of this year, Liverpool FC went further. With the 96 victims now fully vindicated, the club acted in solidarity by barring all Sun journalists from reporting on home matches at Anfield and denied all access to hold interviews with either the players or team manager. And everyone of goodwill loudly applauds the ban. But the horrific events of April 15th 1989 (twenty-eight years today) that resulted in 96 totally avoidable deaths were also part of a greater tragedy – the last in a terrible series of football disasters that twice befell Ibrox (25 fatalities, 1902; 66 fatalities, 1971), Bolton in 1946 (33 fatalities) and then in very quick succession took 56 lives in the Bradford fire and, too often forgotten, at Heysel (39 fatalities) both in May 1985. So let us never forget that even such comparatively recent tragedies as Hillsborough, Heysel, and Bradford happened in a very different era: prior to the formation of the English Premier League and the Champions’ League, and in years preceding the spectacular TV deals and the phenomenal wealth that nowadays streams into football’s coffers. Grounds were mostly dilapidated, the facilities basic, and fans in their tens of thousands were routinely crammed in as tight as possible on stepped terraces behind crush barriers – past lessons were never learned. But then, before the gentrification of the sport, football was chiefly the preserve of the working class; a lowbrow and uncultured spectacle. Respectable opinion held that football inevitably “attracted” hooliganism, and the rest of society – the middle class in particular (the strata of society I was born into) – was highly contemptuous toward anyone closely associated with the game, especially the fans. As a young supporter and grammar school pupil in Shrewsbury (Shropshire still maintained the 11+ system), I was more than conversant with attitudes of this kind. Many who had never entered a football stadium envisioned outbursts of violence at every match, when in reality such eruptions, especially inside the grounds, were rare and deeply shocking even to a regular goer – yet the presumption that all fans were “mindless animals” became commonplace. This judgement had been cultivated by the media (an extension of the middle class, of course) who fixated on football hooliganism, raising its significance far above other kinds of gang related violence. In some unaccountable but unique way, the media felt required to say, it is the nature of the game as such that triggers the violence. And this nonsense was widely echoed. (Nowadays religion, Islam in particular, comes in for the same flak.) But silently at root lay a perennial fear and loathing of the contemporary underclass – of yesterday’s ‘chavs’. Then predictably, during the height of the Thatcher years when everything proletarian was despised, the authorities took a fateful decision and penned us – the “mindless animals” – in: constructing high perimeter fences around every ground, including the one that trapped the innocent victims at Hillsborough. Back in 1985, then-Chairman of Chelsea FC, Ken Bates, had seriously proposed electrifying the fences at Stamford Bridge. Fortunately, Bates was ignored. Without the fences it is likely that no-one would have died at Hillsborough. Click here to read Ingham’s complete letter. “The citizens of Bradford behaved with quiet dignity and great courage. They did not harbour conspiracy theories. They did not seek endless further inquiries. They buried their dead, comforted the bereaved and succoured the injured. They organised a sensible compensation scheme and moved on. Others in the ranks of our corporate media dutifully looked on aghast of course. Indeed, they would have loved to have patted themselves on the back at the significant role they played in bringing justice to the families. In reality, however, the press mostly played a very different role, maintaining a conspicuous silence throughout more than two decades, and paying little regard to contradictory evidence as it slowly emerged. Speaking in a personal capacity, Trevor Hicks, president of the HFSG [Hillsborough Family Support Group], whose teenage daughters Sarah and Vicki were among the 96 killed, said: “The Sun’s coverage did enormous damage to me, [his then wife] Jenni and all the families and caused us great distress. We tried to contact the Sun many years ago; we asked them to name their sources for the scurrilous stories, but we never got that and we have never moved on since. So where was the orchestrated clamour to put a stop to fake news after the Hillsborough verdict? Ah, but this was corporate fake news. Apparently, there’s a difference. To understand more about the government’s role, I recommend reading Craig Murray’s carefully considered appraisal of the released documents. All of the revelations disclosed by the Hillsborough Independent Panel can be read online at http://hillsborough.independent.gov.uk/. The 1980s was a defining period for modern Britain. A decade when the forces of capital led by Thatcher’s government cracked proverbial knuckles and set about crushing the trade union movement to establish permanent ascendancy over workers’ rights. One key part of this strategy involved the steady dismantlement of Britain’s industrial base and vital to this, since essential for all the heavy industry at the time, was ensuring the closure of the coal mines. To these ends Thatcher personally approved the appointment of Ian MacGregor to head the National Coal Board (NCB) – a known hatchet-man who was already responsible for drastic cuts to British Steel prior to its sell-off. As MacGregor set about turning the NCB into a “profitable concern” laying out plans for a devastating programme of pit closures, the NUM, under the charge of its militant leader Arthur Scargill, laid down tools in an unballoted (but widely supported) all-out strike against “the American butcher of British industry”. 6 This move, although lacking in strategy (and Scargill was heavily criticized for his timing), had effectively been forced by the government, who were well-prepared for the showdown and, as we learned later, stockpiled coal to ensure that the lights remained on whatever happened. Once the strike was called, the stakes could hardly have been higher for either side. Thatcher, determined to break the strongest of all the unions, would not have been the first Tory Prime Minister defeated by the miners. But the miners were fighting for their livelihoods and the future of their communities. Predictably, therefore, tensions quickly escalated. In response, police forces from Nottinghamshire and Yorkshire were given unprecedented new powers allowing them to restrict free movement and association, and they increasingly adopted a military style approach to smashing up the protests. The most violent of all the confrontations took place on June 18th 1984 outside the gates of the Orgreave coking plant near Sheffield again. It turned out to be pivotal moment in the dispute and in modern British history. 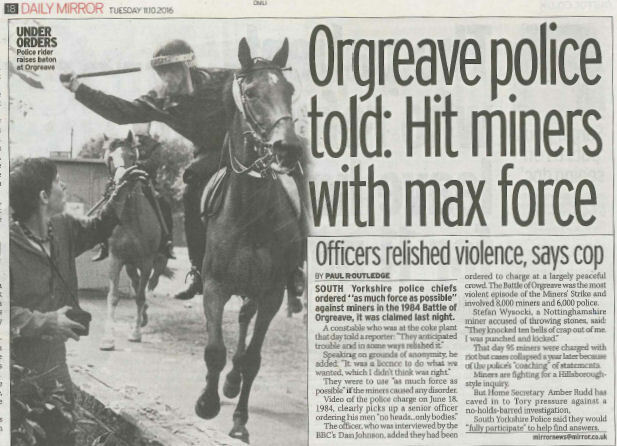 The “Battle of Orgreave”, as it is now known, began after a section of mounted police charged into pickets who were already corralled on an adjacent field. The miners retaliated with a barrage of missiles hurled at the police lines. On the BBC news report later, however, the course of events was replayed in reverse and so the film showed the miners throwing stones, and then police charging back on horses in response. History was thus reedited. The BBC acknowledged some years ago that it made a mistake over the sequence of events at Orgreave. We accepted without question that it was serious, but emphasised that it was a mistake made in the haste of putting the news together. The end result was that the editor inadvertently reversed the occurrence of the actions of police and pickets. Benn is then asked to respond to the BBC apology and says “they didn’t make a mistake… whoever gave the orders actually destroyed the truth of what was reported”. Meanwhile, in 2012, the Orgreave Truth and Justice Campaign (OTJC) was formed, following the success of the Hillsborough Justice Campaign. It is campaigning for a full and independent public inquiry into the assaults, wrongful arrests of nearly a hundred miners and false prosecutions (all subsequent trials collapsed) which human rights lawyer Michael Mansfield QC later described as “the biggest frame-up ever”. After Hillsborough, egged on by the police, the media unfairly blamed the fans for the disaster, accusing them of being drunk, arriving late and trying to get into the match without tickets, an account which the Inquest jury has now roundly rejected. In neither case has there been any proper accountability for what the police did wrong. The way in which the police abused their power at Orgreave, lied about it and got away with it, fostered the culture of impunity which allowed the cover-up after Hillsborough to take place. Had the police lies after Orgreave been properly and publicly addressed, the Hillsborough cover-up would never have been allowed to happen. Click here to read the full OTJC statement. It’s said (especially by journalists!) that “journalism is the first draft of history”. 9 I would merely add that historical revisionism likewise begins in those very same newsrooms. The events quickly reinterpreted according to the diktats of the establishment line. Editors and producers are guilty of many sins. For my money, however, the biggest and lying-est are the big lies of omission that leave important facts unknown to the public for years and even decades, result in many deaths, and let the perpetrators off the hook both legally and historically. For the better part of a decade, American citizens paid good money for newspapers that purported to bring them the news from Vietnam. What those papers never told them was that the reason LBJ gave for entering the war, a 1964 attack on American ships in the Gulf of Tonkin, never happened. This isn’t controversial; liberal and conservative historians alike agree the war was sold on fake news. Imagine if the media had begun every story about Vietnam with a Trump-era-ish reference to Johnson’s big lie? “Continuing Unprovoked Attack on North Vietnam, U.S. B-52s Rain Death on Hanoi Without Reason.” Significantly less than 58,000 Americans and 2 million Vietnamese might have died. After the U.S. lost — which they reported as a withdrawal rather than what really happened — lazy and easily cowed journalists and editors let stand the canard that returning Vietnam War vets were spat upon, insulted as “baby killers” and generally mistreated by dirty leftie hippies waiting for them at the airport. It never happened. To the contrary, the antiwar movement was supportive of vets, running clinics and other facilities to help them out. The myth of the spat-upon hippie, it turns out, began with the 1982 movie “Rambo,” when Sylvester Stallone’s character says it — probably as a metaphor. Afghanistan’s Taliban government had nothing to do with 9/11, but few Americans know that. Even the soldiers sent to fight, kill and die there thought they were avenging the attack on the World Trade Center — and why not? Thanks to the Bush-era fake news purveyors, few of even the best read and most informed Americans know that Osama bin Laden was already in Pakistan on 9/11, that the Taliban offered to arrest him and turn him over if the U.S. showed some evidence of his guilt, that Al Qaeda had fewer than 100 members in Afghanistan (the vast majority were in Pakistan, as were the infamous training camps), and that there wasn’t a single Afghan among the 19 hijackers. Would Afghanistan have become America’s longest war if news headlines had read something like “Bush Promises To Hunt Down Bin Laden and Al Qaeda in Country Where They Aren’t, Sends Weapons and Cash to Country Where They Are”? Doubtful. That the media fell down on the job during the build-up to the Iraq War is well-documented. Yet, even after the WMDs failed to turn up in that country after we destroyed it, the media never applied the standard they now stick on Trump, e.g. “Continuing Unjustified Assault on Innocent Iraq, Marines Prepare For Battle in Fallujah.” Talk about fake news — even if Saddam Hussein had had WMDs, Iraq’s lack of long-range ballistic missiles meant it never could have posed a threat to the United States. Alternative facts abounded under Obama. Click here to read the full article by Ted Rall. BBC coverage of Libyans celebrating “liberation” in Green Square Tripoli in August 2011 was even more fraudulent. French journalists are teaming up with Facebook and Google to create a new fact-checking service aimed at tackling the rise of “fake news”. The news organisations operating in France will collaborate with the two technology giants to debunk false information amid an increase in pressure in recent weeks to prevent the spread of fraudulent reports. From a BBC news article written by an uncredited author (an increasingly common occurrence in these days of ‘fake news’) published on February 6th. Facebook will enable users to flag information they suspect to be false, then make the links accessible to its partnered media outlets to verify the contentious article. If two media sources deem the information to be false, the post will appear on Facebook with a banner signalling that two fact-checkers have disputed its contents. If you follow this blog then you will perhaps be familiar with the name Crosscheck. As recently disclosed by investigative reporter Greg Palast, Crosscheck was the “Interstate Voter Registration” system that, under the direction of Kansas Secretary of State and Trump operative, Kris Kobach, purged millions of Americans – mostly Black and Latino – from the voter registers. It’s once bitten, twice shy for Google and Facebook. Together they’re taking a stand against the fake news that helped skew the narrative of the 2016 US presidential election. Google released a similar project called Electionland during the 2016 U.S. election, though fake news was still criticized during the American political showdown. Perhaps, however, this second iteration will prove more effective. So just who are the “CrossCheck partners”? Well, I searched and searched through the top searches on Google and could find only a few of the 17 newsrooms – here’s the most extensive list: AFP (Agence France-Presse), BuzzFeed News, France Médias Monde (via les Observateurs de France 24), France Télévisions, Global Voices, Libération, La Provence, Les Echos, La Voix du Nord, Le Monde (Les Décodeurs), Nice-Matin, Ouest-France, Rue89 Bordeaux, Rue89 Lyon, Rue89 Strasbourg, Storyful, and StreetPress (courtesy of Digital Trends). Click here to read a fuller report. In the early, Brown Moses, days,Higgins used to make frequent appeals for finances, with support links prominently displayed. However, the current Bellingcat site doesn’t even appear to have a ‘donate’ / ‘support’ option. And Bellingcat has grown to an operation which lists itself as being run by ‘eight volunteers’ but is clearly far in excess of that – a professional website which is updated sometimes with several articles a day, on which extensive research has been expended. But when it’s Bellingcat, all the evidence shows that the research is done to back up a conclusion already arrived at, rather than arrive at a conclusion based on research. This recent, absolutely comprehensive, article makes the point, one yet to have penetrated the public perception of ‘open source investigation’, that all this new jazz can be used as the respectable front for one of the oldest scams, falsification – see this tweet on the theme. Creating social media accounts to post misinformation, free of all the source checks, verification of other sources as this is ‘citizen journalism’ and all things cool, which can’t be questioned because a lot of people don’t really know what they are. This, then passed off, and on, into Bellingcat, and up it goes higher into the food chain of mass media, unquestioned, unchecked. It’s very handy for some people, having a guy who doesn’t need to be sent anywhere, who, from his sofa, can quickly come up with the conclusions so beloved of western press, and governments. He’s also clearly a hard worker, dogmatic, persistent, the man who used to spend endless hours gaming now happy to spend that time on Bellingcat ‘investigations’. Higgins took part in the official MH17 investigation, and even boasted about knowing the result of the MH17 report before it was released – so sure was he, he even challenged me to a bet over it (I declined). So, make your own mind up. 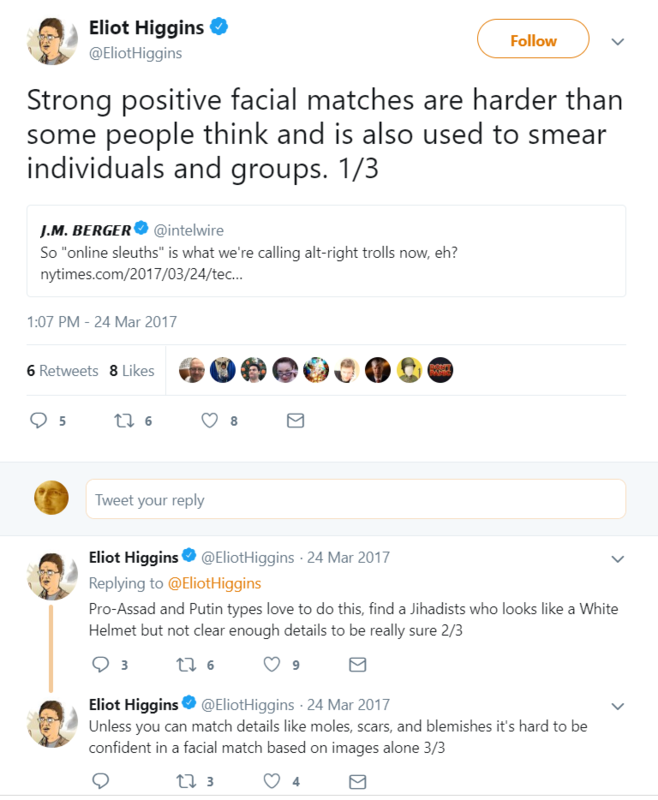 Who is Eliot Higgins, and Bellingcat, really? Are they indeed the experts the western media would have us believe? Or are we being stitched up by a man either of limited abilities plunged into the limelight, making the most of all that goes with it – fawning western media write ‘He often doesn’t finish sentences, as if his mind is racing elsewhere’ – but could it be, that Higgins is actually rather simply rather a dim man, being used, and fine with that, by higher powers? When Fallon says “we see a country that, in weaponising misinformation, has created what we might now see as the post-truth age” he is deliberately spinning the official line that the information war is both a recent invention, and, more importantly, that it is purely the work of the Kremlin. A bizarre claim that in turn rests on entirely baseless accusations that ‘Russia hacked the US elections’; an allegation first formulated to protect the DNC from whistleblower leaks (see here) but endlessly echoed by a lazy and pliant media which discredits itself every time it repeats the story and further echoes the claims that it is fact-based. So, were Trump and his associates “wiretapped?” Of course not. Wiretapping went out of vogue decades ago, having been rendered obsolete by leaps in surveillance technology. The real question is: Were Trump and his associates surveilled? Wake up, America. Was no one paying attention to the disclosures from NSA whistleblower Edward Snowden in 2013 when he exposed Director of National Intelligence James Clapper as a liar for denying that the NSA engaged in bulk collection of communications inside the United States. Click here to read the full article entitled “The Surveillance State Behind Russia-gate”. Another serious matter that ought to trouble us is that rather than seeking insight from recognised experts like McGovern and Binney, the corporate media turns to self-styled non-specialists such as Eliot Higgins aka Bellingcat or Rami Abdulrahman aka Osama Suleiman’s puffed up Syrian Observatory for Human Rights (SOHR), who invariably tell them exactly what they want to hear. And I must say I’m very disturbed by the press continuing to use them as a source for information, when the press has to know — if they did any work at all — that these guys have been shown in detail to be frauds. The quote above is from a newsletter published by the American Foreign Policy Council published in September 2015. Reading between the lines, Waltzman is advocating a new intelligence hub to spread influence throughout what he defines as the ‘Information Environment’: a new security agency that brings America closer to the neo-con dream of ‘full spectrum dominance’. The passage of this bill in the Senate today takes us one critical step closer to effectively confronting the extensive, and destabilizing, foreign propaganda and disinformation operations being waged against us. While the propaganda and disinformation threat has grown, the U.S. government has been asleep at the wheel. With the help of this bipartisan bill, the disinformation and propaganda used against our allies and our interests will fail. Congress has taken a big step in fighting back against fake news and propaganda from countries like Russia. When the president signs this bill into law, the United States will finally have a dedicated set of tools and resources to confront our adversaries’ widespread efforts to spread false narratives that undermine democratic institutions and compromise America’s foreign policy goals. The bill would increase the authority, resources, and mandate of the Global Engagement Center to include state actors like Russia and China in addition to violent extremists. The Center will be led by the State Department, but with the active senior level participation of the Department of Defense, USAID, the Broadcasting Board of Governors, the Intelligence Community, and other relevant agencies. The Center will develop, integrate, and synchronize whole-of-government initiatives to expose and counter foreign disinformation operations and proactively advance fact-based narratives that support U.S. allies and interests. Click here to read the full article entitled “Counter-Propaganda Bill Quietly Creates US Propaganda Factory”. The extract above is drawn from an excellent and extremely prescient article written by Naomi Wolf and published by the Guardian in 2007. It is entitled “Fascist America, in 10 Easy Steps”. Five years on, and the mainstream media is no less bridled; the same small corporate cartel, that is bent on privileging the special interests of a few powerful owners and sponsors, maintains its dominance. And although, in the meantime, the challenge from independent voices has been steadily on the rise via the internet, it is in precisely these areas of the “new media” where controls are now being brought in. But applying restrictions requires justification, and so these latest attacks against freedom of speech are couched as a necessary response to what the government deems, and thus what the public is encouraged to believe, to be a threat. So which is the greater threat, a few people with alternative views and accounts, or the kinds of subversion of (or even outright clampdown on) free speech proposed, and now being put into effect by Cass Sunstein? Simply being out of step with the official line is now enough to get you categorised as an “extremist”, and so a distinction that was once reserved for those who threatened the use of violent overthrow, is now directed against anyone who merely disagrees. Click here to read my full post entitled “12 steps to tyranny – the state of America under Obama”. No lesser authority than Adolf Hitler famously said “Propaganda must confine itself to very few points, and repeat them endlessly”. 30 And this “fundamental principle” as he called it has become the unsurpassed precept that now informs all PR, all advertising and infests every corner of our world with the hi-tech conjuring of (post-)modern propaganda. The Nazis lost the war, but in this regard their methods more than survived. In fact, they have been honed ever since. With Trump in power, allusions to Hitler and fascism are all the more vogue. Drawing comparisons to twentieth century fascism is indeed the currency of right-minded liberalism in the West, and most especially amongst many who held their tongues throughout the duration of Obama’s tenure: turning a blind eye to “Terror Tuesdays”, failing to speak up against the silent menace of his drones, and content that the battlefields across Africa and the Middle East of his continuing “war on terror” were faraway and probably for the betterment of humanity. Whereas Trump is a racist, they rightly inform us today, forming an impossible distinction between two phases of the West’s “war on terror” which has always been racist in its conception. Today there is another trope. Just like Brexit, these same liberal commentators now inform us, Trump’s victory is ample proof that we are living in a “post-truth” era. Oddly, this opinion is something that Trump, in his characteristically twisted fashion, appears to share. So whether by accident or design, he has already stolen much of the thunder simply by flinging his own accusations of ‘fake news’ at all and sundry. Did the liberal proponents of the meme really not envisage propagandistic blowback of this kind? In 2003, when we were told that half the world could be obliterated by Iraqi weapons within 45 minutes, were we still in pre-post-truth politics? At the start of this decade, when governments across Europe did everything to convince us that a global financial crisis had been caused by giving too much money to disabled people—was that also part of the lost golden age? When we entered the First World War to stop Belgian babies from being impaled on bayonets? When kings ruled by divine right? Of the top 100 US newspapers, 47 ran editorials on President Donald Trump’s Syria airstrikes last week: 39 in favor, seven ambiguous and only one opposed to the military attack. In other words, 83 percent of editorials on the Syria attack supported Trump’s bombing, 15 percent took an ambivalent position and 2 percent said the attack shouldn’t have happened. Polls showed the US public being much more split: Gallup (4/7–8/17) and ABC/Washington Post (4/7–9/17) each had 51 percent supporting the airstrikes and 40 percent opposed, while CBS (4/7–9/17) found 57 percent in favor and 36 percent opposed. From an article produced by US Media watchdog Fairness & Accuracy In Reporting (FAIR) published on Tuesday 11th. Click here to read the full article entitled “Out of 47 Major Editorials on Trump’s Syria Strikes, Only One Opposed”. Propaganda is a vital weapon of modern warfare: insidious and strangely hard to detect, it is the dark agent that incites and cajoles a population to act against its own better judgement. For the greater part of a century we have all lived in the shadow of war: the Second World War bled out into the Cold War, the Cold War into this more perpetual blackness of the ‘War on Terror’. Tomorrow one can only dread to think. Throughout this same period we have been immersed in wartime propaganda. But like fish swimming in polluted water, we remain largely unaware of how it is suffocating us on a daily basis. Yesterday’s villain was Stalin, then Brezhnev, Castro, Milošević, Saddam, Noriega, Ahmadinejad, and Gadaffi. Today it is Assad. Since hatred is better focused, we prefer to deal with our monsters one at a time. In the meantime America and the West has courted friendly relations or even been close allies with Batista, Pinochet, Marcos, Suharto, Karimov, General Franco, the House of Saud and not forgetting our later villains Saddam, Noriega, Gadaffi, and Assad. Not that either list is exhaustive – for a more complete catalogue click here. The point is that there is no genuinely ethical component in the West’s choosing of sides. America, in particular, has a diabolical record of allying with despots to put down democratic forces. What is truly alarming, however, is how easily amnesia sets in. That familiarity with what is an absolutely damning litany of recent lies and deceptions that propelled us into an expanding sequence of dirty wars beginning with Vietnam still fails as a safeguard against renewed propaganda offensives. Somehow in spite of the old lies, the new ones are able to sway and cajole enough of us by means of bogus pleas for justice and demands for ‘humanitarian intervention’. The US has finally confirmed that it has fired DU ammunition Syria, after it had earlier stated that the weapons would not be used. US Central Command (CENTCOM) has acknowledged that DU was fired on two dates – the 18 and 23 November 2015. Between the strikes on the two dates, 5,100 rounds of 30mm DU ammunition were used by A-10 Thunderbolt II aircraft. This equates to 1,524kg of DU. CENTCOM said that the ammunition was selected because of the “nature of the targets”. Click here to read the full report entitled “United States confirms that it has fired depleted uranium in Syria” published by the International Coalition to Ban Uranium Weapons (ICBUW) on October 21, 2016. Read more about DU and its effects in this earlier post. 5 From “Part One: Lost Letters”, The book of laughter and forgetting [orig: Kniha smíchu a zapomnění] by Milan Kundera, first published in France in 1979. 10 From Homage to Catalonia by George Orwell first published in 1938. “So let me just give you two examples of just the corruption that’s at play here. So, when the Post unveiled their huge story about Russia fake news based on this McCarthyite list that has been proven to be a fraud, they had Marty Baron, the executive editor, the widely respected executive editor of the paper, go onto Twitter and announce this huge exposé. And predictably, it got tweeted and retweeted and shared thousands and thousands of times by all of the biggest journalists with the biggest social media followings. When the story collapsed over the next two weeks and they appended this huge editor’s note, The Washington Post did nothing to bring anyone’s attention to the fact that the key claims of the story have been gutted. Marty Baron refused to answer any questions over that two weeks about what the paper did, and he uttered not one syllable on Twitter or anywhere else to tell all the followers that he alerted to this story that the story had collapsed. “With the story that I just talked about over the weekend of the—of how Putin had wanted to steal the heat from Vermonters to make them suffer in the winter, Brent Staples, who works for The New York Times editorial page, went on Twitter and said, “Our friend Putin has invaded the U.S. electric grid.” And when that story collapsed and The Washington Post retracted it, he did something even worse: He just went and quietly deleted his tweet a day later, as though it never happened, and also failed to tell his 30,000 followers that what he had just told them the day before, that caused them to run around and share with all their friends on Facebook and Twitter that this has happened, was in fact a complete fiction. This author, as a program manager at the Pentagon’s Defense Advanced Research Projects Agency (DARPA), recently concluded what is probably the largest ever government sponsored research program in foundational social media technology, known as the Social Media in Strategic Communications (SMISC) program. SMISC researchers accomplished amazing things and significantly advanced the field resulting in over 200 publications in the open literature, as well as developing a number of groundbreaking technologies ready for application. At this point, the biggest fear is that, because of uninformed and antiquated policies and undue legal constraints, the principal beneficiaries of this work will end up being not the U.S. government but its adversaries. To ensure this does not happen, the United States needs to create a new Center for Information Environment Security, the goal of which is to create and apply the tools needed to discover and maintain fundamental models of our ever-changing IE and to defend us in that environment, both collectively and as individuals. Such a Center would bring together experts in areas such as cognitive science, computer science, engineering, social science, security, marketing, political campaigning, public policy, and psychology, with the goal of developing a theoretical as well as an applied engineering methodology for managing the full spectrum of information environment security issues. The U.S. government has already laid the foundation for such a construct; now is the time to erect it. 27 “Fascist America, in 10 Easy Steps” by Naomi Wolf, published in the Guardian on April 24, 2007. From Mein Kampf by Adolf Hitler (1925), as translated to English by James Murphy (February 1939). 33 From an article entitled “Out of 47 Major Editorials on Trump’s Syria Strikes, Only One Opposed” written by Adam Johnson, published by Fairness & Accuracy In Reporting (FAIR) on April 11, 2017. Russian hacking is a silly smokescreen, so what’s behind it...? A published version of my travelogue "Arusha to Zanzibar" is now available in paperback. Click the link below if you'd like a copy of the book, which I'm selling on a non-profit basis at cost price.